MAY 22ND: PRAYER WARRIORS spend one hour praying in front of the Whole Woman’s Health Abortion Facility at 7405 N. University in Peoria. For more information, call Barbara, 309-388-0145. 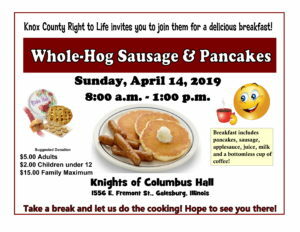 JUNE 11TH: KNOX COUNTY RIGHT TO LIFE MEETING, at 7:00 p.m. at First Church of the Open Bible, 521 W. Losey St., Galesburg. For more information, call Mary N., 309-343-0621 or Pat C., 309-343-2852. JUNE 26TH: PRAYER WARRIORS spend one hour praying in front of the Whole Woman’s Health Abortion Facility at 7405 Nl. University in Peoria. For more information, call Barbara, 309-388-0145.